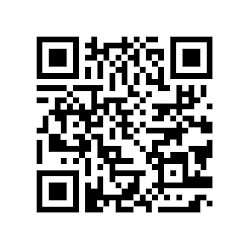 Learning for Life: Art as a process. This week my class got to paint their 'paper people', these are always a big hit with the class and they love to see them up on display and there is always lots of excitement when they take them home. Last week before we broke up for a long weekend I explained they would be painting these large paper people shapes, one child got very excited as he knew there was one at home already belonging to his older brother. Now, many might see these templates as cookie cutter art but I would argue against this view. Templates have a place in any art process - these paper shapes give the children a starting point but no one is in any way similar to any other. 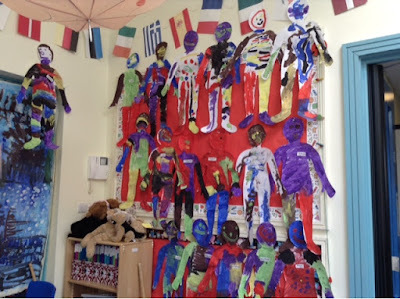 I was amazed 5 years ago when one by one each child painted their paper person mostly blue to show they were wearing their uniform. It had never happened before and so far hasn't happened again, this year the children embraced the chance to paint using all the colours on offer and mixing them up to make different shades etc. 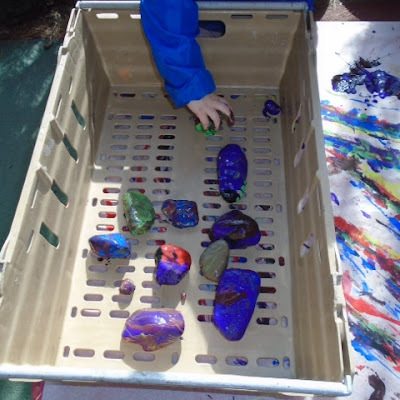 I think in preschool we need to give as many different art opportunities as we can and it is part of our role to actually encourage children to take part in representational art activities as well as purely creative art activities. 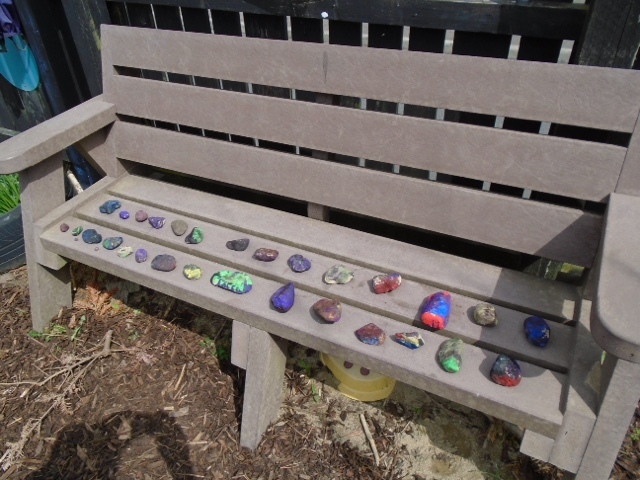 The children loved painting these 'rock babies' for us to enjoy playing with in the playground. It was a wonderful process to see the paint running off the rocks and opportunities to paint 3d objects should be encouraged as much as possible too. Young children can paint representational images if given time & space to look closely at what they are being asked to paint. 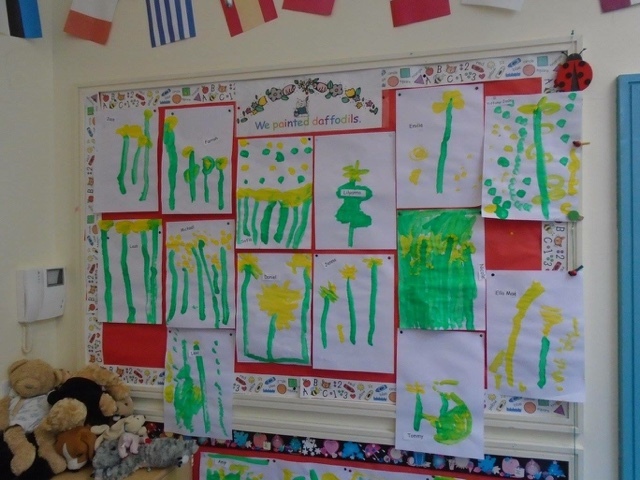 Another piece of art the children were very proud of when it was all displayed was their daffodil paintings. They are again, all very different but it was important that I as, the teacher, encouraged them to look at the flowers and really think about how they could paint their representational image. Every 6 to 8 weeks we ask the children to draw a self portrait for their portfolio booklets and it is wonderful to see these develop over the school year. They usually have 6 portraits by June and it is a great visual way for the staff, parents and children to see how skills have developed over the year. When drawing these, the children are encouraged to look into a mirror and again, really think about what they are going to draw. 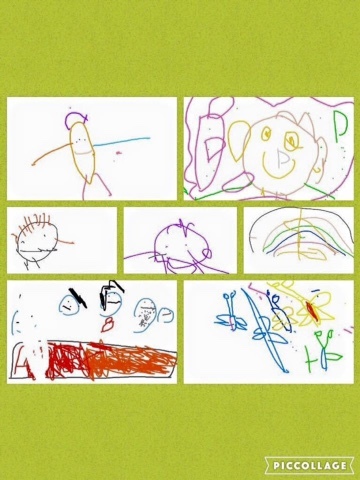 From experience, talking about these self portraits the day before is usually a great way to encourage the children to be even more ready to attempt the task. Another art opportunity is provided on the iPads and this year we got a few iCrayons so that the children get the chance to practice their pencil grip while drawing on them rather than using their finger. I think preschool teachers have to ensure that the young children in their classes begin to see that there is a place for representational and creative art. Young children are probably the best at being able to see the potential of any image to be whatever they want it to be but they lose this as they get older. I do fear that the latter gets less of an emphasis in the lower primary end and that is why I hear 7 or 8 year olds tell me that they are 'rubbish at art/drawing' yet I remember them as being very creative in nursery. 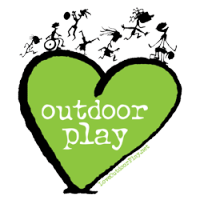 Unfortunately as there are more and more budget cuts in education, art will be squeezed out even further in primary school timetables and the opportunity for children to begin to fully understand the place for representational and creative art and to realise each has it's own value will be lost. I must say I like everything you say here, and I think it's important to use the best of every teaching approach.